– To prep for the trip, I did my laundry and started to pack my clothes. I can now only wear the clothes I am taking. The rest is being put into storage. I made sure to pack cute socks and underwear. I’m camping for 6 weeks. People will likely see me in my underwear. You’re welcome. – I am also packing a suit. I don’t know why I need a suit, but I’ve learned to always travel with one. – So many plans for the day but WOKE UP with a headache. So, today wasn’t a day that was productive as I would like. – I DID manage to loose my book. So, I’m going to replace it with a digital copy. Also, lost my earphones. Luckily, I have back ups. – This means I started a Scribd account. And am listening to the audio book of World War Z. Is it good? Let’s just say I hung outside of where I needed to be to get to a good stopping point. Have any favorites up there? Let me know so I can add to my library. Thoughts on comics particularly welcome. – I love a good set of co-incidences. My house mate works at Gray Area (art and technology education and public programs) and I looked at the sign when they said “gray area” in my audio book. It’s a book about zombies, and I went to a gallery show about devices for the dead in a building that was an embalmers. On my way to meet some friends, I ran into another friend. And that lead to a whole other string of beautiful connected moments. –Valerie’s show is beautiful. She pointed out to me her favorite and her most prized. I won’t say what is what. She also told me the story about the child of Prague. I left a quarter. 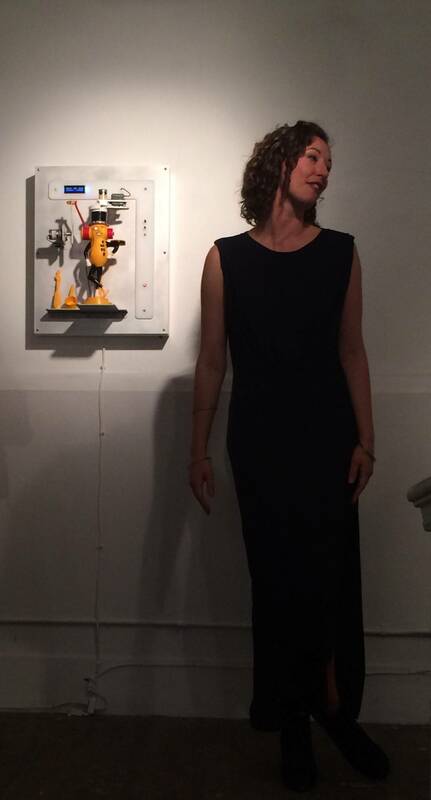 – Valerie in front of one of the pieces in her show. I liked the Warhol/Duchamp feel. – I am on purpose leaving out a big part of my evening. I went to a thing. I didn’t have a ticket, but because I stood outside and talked nicely to the promoter, he walked me in. Saw friends, brought people who had never seen that part of the city, saw strangers testing/breaking/moving past social constraints to find joy. People making the most of not much. People finding joy and minds blown. These are my favorite sort of moments. I’m going to stop the description there. Sometimes you need to make space for things so they can survive instead of promoting them to their detriment. But, I mention it at all because someone told me there is no more underground. There is, if you let it happen. Saying yes is the first step. July 11, 2015 – Stories I am looking forward to rememberingJuly 9 – This isn’t who I intended to be when I grew up. Luckily, I didn’t let a 12 year old decide who I was going to be.